We’re proud to announce the winners of our West Midlands Conservation Awards in recognition of land managers outstanding efforts to enhance habitats for wildlife. 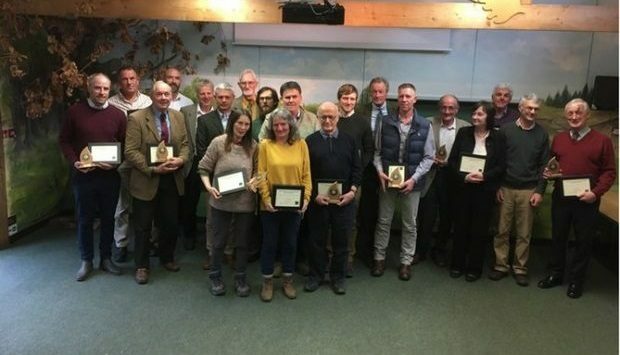 To show our appreciation to fourteen land managers from across the West Midlands, Natural England Board Member, Henry Robinson presented these unsung heroes with a Conservation Award in recognition of their outstanding efforts to enhance habitats for wildlife on Thursday 28 February 2019 at the Wyre Forest Discovery Centre. This year our deserved winners included farmers, land managers, local council rangers, developers and small volunteering groups – who have all done remarkable things to improve and enhance wildlife within their local area. Some of our winners have been the driving force behind the management of a common, making significant progress towards restoring species rich grassland, and delivering landscape scale gains through innovative management practices. Some turned the states of their farms and Sites of Special Scientific Interests (SSSIs) around through management practices to transform the land into favourable condition. Others volunteered their time to contribute to biological monitoring. We want to continue to recognise the remarkable amount of work done by individuals to protect and enhance the wildlife on their own doorsteps. People are the key to reversing the decline in many of our native species and habitats and that is why we are rewarding these unsung local heroes who have been putting their own time, and effort into the fight to improve England’s fantastic landscape, in order for animal and plant life to thrive. There are a wide range of individuals working away in the background to make a difference for their local wildlife, and their efforts are often unnoticed and unrewarded. We wanted to say thank you for all that hard work that makes such a difference. Mark Snelson from Whittimere Stables in Staffordshire received the Conservation Award on behalf of the whole Snelson clan. The Snelson’s at Whittimere are a farming family of three generations who work together to produce quality crops, whilst ensuring their farming practice has as few negative impacts as possible on the local wildlife. They’re working hard and trailing different methods, techniques and seed mixtures to target species located in and around the farm. The Conservation Awards Ceremony was a fabulous celebration throughout the heart of England. An informative, fascinating and eye opening evening which has given us quality time to glean ideas from other like-minded folk that are all interested in adding conservation value to our countryside. This is a journey we started many years ago and has been a joint effort between Natural England and ourselves, and was also achievable due to the sensational encouragement and specialist advice from our Project Officer Tracey Hill and all the team in Telford. This council has a fantastic attitude to the management of the Broad Green SSSI. The parish councilors involved with the SSSI have made sure they understand how the site needs to be managed in order to maintain favourable condition. Although they do not have any specialist knowledge, they understand its value and are proud of it. Brothers, Rob and Chris Matthews from Worcestershire are property developers with a conscience. They believe that wild areas not only help wildlife, but bring enjoyment and enrichment to the lives of residents. Badges resided in a recent development site in Rose Bank, Worcester, hemmed in on all sides by development and infrastructure. Rather than relocate the badgers, the bothers went far beyond what was required of them, and set aside an area for the badgers and other wildlife. Four artificial setts were created as part of the compensation package when no formal artificial sett was required as part of the license. Read more about Matthews City and County Homes win here. Jan and Mike have been in Stewardship schemes for over 20 years and have spent this time improving and developing the wildlife on their farm. They are completely committed to their local environment and are members of the local facilitation group as well as the Worcestershire meadows guardians. John has been awarded this prestigious award for his great attitude and commitment to conservation. This has been implemented through a range of arable options he provides within his Higher Level Stewardship Agreement such as the creation of two areas of butterfly habitat to buffer the adjacent Park lime Pits Local Nature Reserve, low input spring cereal, flower-rich grass margins, wild bird seeds and nectar mixes. Together, Perry Adams and Antony Ravenscroft, Dudley Council Wardens and Nick Williams, a local mycologist, have worked together tirelessly to get the monitoring and management of the Leasowes grassland site just right despite the challenges and community engagement that comes with an urban site. Due to their commitment, the site has recently been awarded with much-needed protection by being notified as SSSI. John has turned Birchwood around after taking on the SSSI from his mother ten years ago. Through positive attitude and sheer determination John has drawn up his own management plan to transform the woodland into favourable condition. Mark has been proactive about looking after the habitats on his holding and recently met with the Barn Own Trust to determine the best locations for barn owl boxes. Outside of the Higher Level Stewardship scheme he has completed, Mark has planted an area of woodland and is keen to help others restore hay meadows through green hay strewing. Trevor has been awarded the Conservation Award in recognition of education local community group events hosted on his farm. Events include a wide variety of topics including small holding management, livestock handling and buying stock, as well as bat courses, fungal foray and wildlife walks. Martin has been nominated for his enthusiastic uptake of the Catchment Sensitive Farming programme, and continued work around promoting extensive and sustainable approaches to farming, particularly around maize. Recently Martin’s farm has undergone major restructuring following a change from dairy to beef production, and has engaged with Catchment Sensitive Farming programme to redesign the farm’s infrastructure. The team has made great contributions to biological monitoring in Gloucestershire through Wetland Bird survey counts, dipper recordings, constant effort sites and botanical surveys. James has been awarded with the Conservation Award as he has been the driving force behind management of the common since a management plan was put in place in 2014, and in the areas he and other volunteers have worked to make significant progress towards restoring species rich grassland. In Staffordshire, Ann Cantrell a Facilitator for White Peak and Churnet Valley Farmers Groups, has successfully established and supported two Countryside Stewardship Facilitation Fund farmer’s groups, the White Peak Farmers and the Churnet Valley Farmers. She freely gives her time to encouraging other groups across the West Midlands, giving presentations and encouraging individuals to join their local group. She has helped to promote the group model nationally at a Defra led event. Find out more about the Countryside Stewardship here.